Mix all the ingredients in a bowl. Let sit for at least 5 minutes and serve. I will make this tomorrow! I love your shows ! Thank you Vanessa! Enjoy the pico. 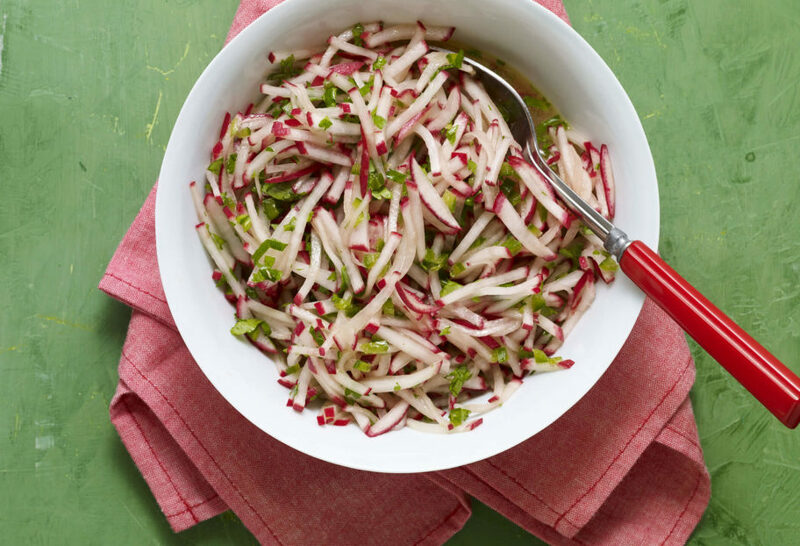 I made this radish recipe along with pickled red onions and a variation of another recipe of beef in green salsa. Assembled on a corn tortilla toasted until crispy and topped with these 3 recipes. Delicious. Thank you for sharing. This makes such an impressive accent to most meals, espicially in the summer. I definitely recommend using your suggested jalapeno. Even if it requires careful cutting. They all enhance each other! Thanks for making meals exciting… Your simplicity is always amazing! So happy you loved it Antonia! Does it taste good on pork tacos? Can you make this ahead? Does it keep well overnight? This is a fabulous relish! So simple and delicious.